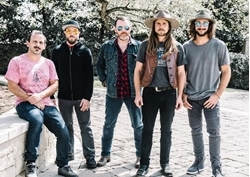 Sons of legends: Lukas Nelson and Dhani Harrison come to Napa for BottleRock . Beatles Radio: The Beatles, Solos, Covers, Birthdays, News The Fab 4 and More! It is hard to think about Lukas Nelson and Dhani Harrison, successful artists in their own right, without thinking about their very famous fathers, Willie and George. The two young men, friends with one another, openly embrace their fathers’ legacies. Each will perform this Saturday at BottleRock. If you listen to this band’s self-titled 2017 debut album, the variety is striking – from plantive country ballads starkly evoking Willie Nelson to R&B to honky-tonk to gospel to acoustic folk music to rock ‘n’ roll and more. “I grew up with a hodge-podge of different influences,” Lukas said, “and when I’m writing, I’m never trying to restrict myself.